How does the new Canon stack up against the Nikon D800? Now that Canon has, finally, unveiled its upgrade to the much beloved 5D Mark II, it's time to start an all-out war and pit the 5D Mark III against the Nikon D800, probably its biggest rival. Nikon impressed with its 36 million pixel sensor, low light capabilities and improvements to its video capability. So, can Canon compete, or has the company lost its edge against its biggest rival? We pit the two new cameras against each other in this early view, which we'll be keen to update fully once the cameras come in for final review. The EOS 5D's 21 million pixel resolution was amazing when it was launched and was still pretty good right up until, let's see, round about February 7th. But the D800's 36 million pixels leave the Canon's 22.3 million for dead. We'll need to see how the cameras perform, however. It is worth remembering that fewer pixels does have the advantage of smaller file sizes and, potentially, less noise. But Nikon has a good track record when it comes to noise control so the jury is out. The video offerings from both cameras are pretty much equal, since both shoot full HD video. The 5D Mark II led the way in terms of DSLR video capability, being the first ever DSLR to introduce it. However, the D800 has done a lot to improve Nikon's offering, namely with options to shoot at different frame sizes for different focal length and depth of field effects, as well as 50p and 60p slow-mo capabilities. Couple those with uncompressed HDMI output, and, on paper at least, the D800 seems to edge it. The 5D Mark III offers a significant improvement in terms of autofocusing, bringing 61 points, compared to the Mark II's 9. 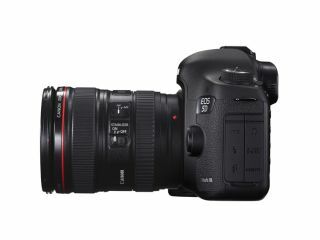 This also beats the D800 which offers 51 AF points, with 15 cross-type sensors. That said, Nikon claims that the D800 can focus down to a light level of -2EV and can still offer 11 AF points with lens and teleconverter arrangements with an effective maximum aperture of f/8, something the Canon camera is unable to match. Here again, the Nikon seems to just about edge it. The D800's brand new 91k-pixel metering sensor sounds impressive. It can even detect human faces when you're using the viewfinder, not live view, and it feeds into the D800's Advanced Scene Recognition System to make metering even more foolproof. Canon on the other hand has employed its iFCL metering system in the 5D Mark III. This incorporates a 63-zone dual-layer sensor linked to each point of the AF system.This is the same system as is in the EOS 7D and although it can be very effective, it puts a lot of emphasis on the subject under the AF point and reacts rather like centreweighted metering. The old 5D Mark II only took one memory card (CF), so to have two slots will surely be a welcome addition. Both the D800 and the 5D Mark III feature dual CF and SD slots, choosing to eschew the new XQD memory card format, which Nikon says it is saving for its top-of-the-line Nikon D4. This is likely to be the biggest sticking point when it comes down the age old Nikon vs Canon debate. For some £600 lower, Nikon has managed to produce the D800 which offers some seriously impressive specs. Whether existing 5D users will be keen to part with the best part of £3,000 for a 5D Mark III remains to be seen, but it is worth considering that the camera packs many of Canon's high-end 1DX specs into a much more affordable body. Both cameras are currently expected to make their debut on the market sometime in March. With both Canon's 1DX and Nikon's D4 have seen delays, hopefully we won't see a similar pattern repeated with the D800 and 5D Mark III.